The Premier Mobile and Manufactured Home Energy Experts for the Finger Lakes! The average owner of a mobile home or manufactured home spends almost double what owners of any other type of housing spend on energy each year. Fortunately, there is a fix, and it may cost you nothing! At Halco, we understand the challenges that you face as a mobile or manufactured home owner. Most mobile and manufactured homes, especially older models, suffer from air leaks, poor insulation, and inefficient heating and cooling systems that can take a big bite out of your budget. The escaping energy creates an uncomfortable living environment with an oversized carbon footprint and a larger than necessary energy bill. Fortunately, there are many home improvements that can be made to get those energy bills down and create a healthier, more comfortable living environment for you and your family. Cost of energy? Physical comfort? Health and home safety? Problems with heating and cooling equipment or larger maintenance issues? Start with a no-cost home energy assessment from Halco to determine where your home is using, losing, and wasting energy and money. From the assessment, a plan can be customized to correct any energy problems that have been exposed. Mobile and manufactured homes are constructed differently that site-built homes. They almost always have downdraft furnaces, meaning the furnace pulls room air into the top of the furnace, and sends the heated or cooled air down into the ductwork underneath the floor. 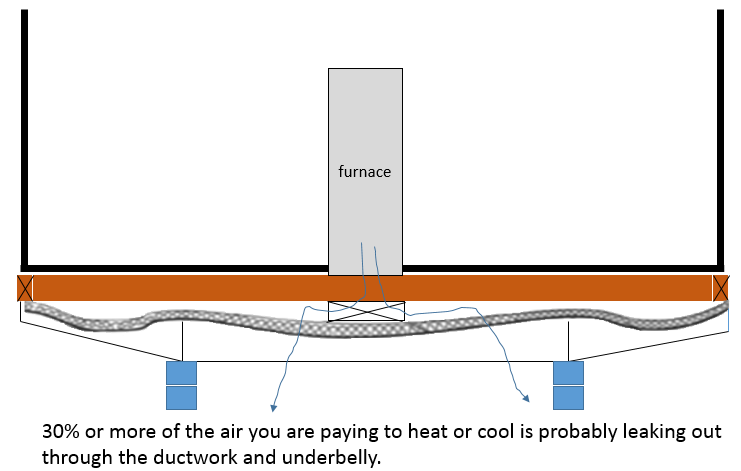 If your ducts are leaky (most are) and you do not have adequate insulation in the underbelly of your home (most don't), that expensive heated or cooled air is being pushed right outside. With the lack of insulation, you may notice that your home is cold and drafty in the winter, and sweltering hot in the summer. The lack of air sealing and insulation will also cause your heating and cooling systems to work harder and longer to keep you comfortable. What's the fix? It's actually not that hard. We will encapsulate the entire underbelly with spray foam insulation. This will keep that expensive energy from escaping your home, saving you money on energy bills and keeping you more comfortable all year round. Check out the success stories of three of Halco's most recent mobile and manufactured home owners! Older mobile and manufactured homes often have open combustion furnaces where the air needed to function comes to the furnace through an outside duct or from the room air. These furnaces often have a gap between the duct and the draft hood, which allows flame roll-out, back drafting, and high levels of carbon monoxide to enter the home. During your no-cost home energy assessment, Halco will test your heating system for safety and efficiency. If any issues are uncovered, your energy advisor will point you in the direction of a much safer and efficient option. New furnaces in mobile and manufactured homes must be HUD approved and must be sealed combustion. If all your furnace needs is a simple tune-up, repair, or new filter, we can do that too! Water heaters should go through a similar evaluation as furnaces as they sometimes pose health, safety, and efficiency issues. By law, your mobile or manufactured home water heater must have a HUD safety approval. Anything else used for a mobile home is against the law. Halco energy advisors will help you find a properly sized and code-compliant water heater that is made specifically for your property. Furnace and water heater cabinets are often in need of repair. The cabinets must be sealed to the inside so that combustion gasses can't get into the living space. All homes can benefit from energy efficient light bulbs. Changing your lights to LED bulbs, switching your lights off when not needed, and cleaning lighting fixtures all lead to savings. Caulking air leaks, sealing and replacing ducts, adding weather stripping around doors, installing energy efficient windows, upgrading to energy efficient appliances, and replacing CO2 and smoke detectors are just a few more of the many improvements that can be made to improve the safety, comfort, and energy efficiency of your home. You may qualify to have this work completed at no cost to you! A common challenge in completing energy upgrades is often finding the money to do the work. As a New York State homeowner, you may be able to take advantage of a number of energy efficiency programs that are funded through the state. If you meet income guidelines, you may qualify for many no-cost improvements. Get started by scheduling your no-cost home energy assessment today!